In this age of increased security risks, workplace violence incidents and negligent hiring lawsuits, employers are using background checks as a tool to identify the most qualified individual available. Therefore, employers are increasing security and decreasing liability and improving the quality of their workforce. For many employers, pre-employment background checks have become a permanent part of the hiring process. However, with the rise of computerization of records and the increased availability of information at our fingertips, legislators and consumer rights groups are taking notice of the background check industry. They make the point that it is important that the rights of the applicant be balanced with the need for employers to hire the best candidate. The primary law regulating the procurement, preparation, and use of a background report is the Fair Credit Reporting Act (FCRA). This federal law was first introduced in 1971 and has undergone several changes over the years. It is designed to protect the rights of applicants and to hold the users and preparers of background check reports accountable for the information contained in and the use of the reports. As with any law, the FCRA is a difficult read and contains much technical jargon. 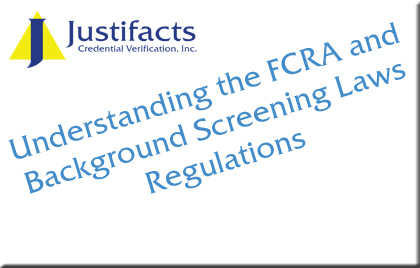 Over a ten-part (ten-week) series, Justifacts will be expanding on the specific sections of the Fair Credit Reporting Act that are pertinent to reports used for employment purposes.